The second European Beer Challenge post in the space of a week I am writing in Copenhagen, Denmark about a Belorussian beer bought and drunk in Vilnius, Lithuania. This is by far the most international of all the reviews I've done so far and with any luck we can add photographed in Australia to that list if my other bottle arrives safely. It is incredibly difficult to find information on this beer. 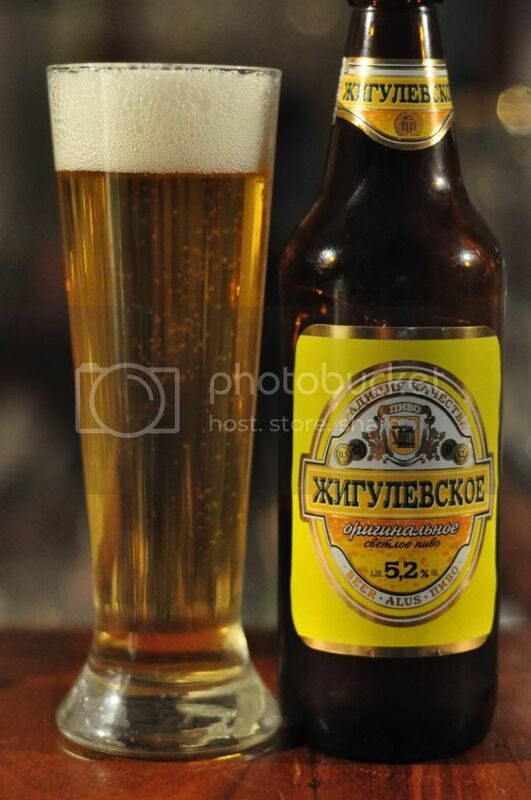 Zhigulevskoye is the name of the old beer of the Soviet Union and there is now a beer with the same name produced in Russia, Ukraine and Belarus. This one is produced by JSC Brestkoye Pivo in Brest Belarus, a small city near the Polish border. Belarus has a population of approximately 10 million and many of them drink beer. Unfortunately for me very little is exported anywhere other than Russia or Lithuania, where my bottle came from. Coll and I cracked these after our day trip to Trakai, the old capital of Lithuania. The glass may not have been perfect but the beer poured well. When the bottle was poured a dark yellow beer spewed forth with a 2 finger head consisting of big white air bubbles. It dissipated quickly but left a ring of foam and a light film across the surface. The carbonation appeared to be relatively low. All-in-all a good looking lager. The nose was pretty average/non-existent. I think this is the perfect time to invoke my rule normally reserved for tropical lagers; if the nose isn't offensive it's ok. And that is the perfect way to describe this beer, there's nothing to like or dislike about it. You can smell the slightest hint of hops over a base of sweetish malts with a tiny bit of something metallic thrown in for good measure. It's a relatively inoffensive aroma. Zhigulevskoye certainly drank better than it smelt, which honestly wasn't bad. The flavour was at first unusual but after a short acclimatization period it settled into a very drinkable beer. It seemed like an odd mix of metal and bitter hops at first with the metal flavour fading after the first 2 or 3 sips and being replaced by sour malts. The carbonation was spritzier than expected and tickled the tongue nicely. While not a beer I could drink everyday, Zhigulevskoye from Belarus, is a beer that I would happily sit down with a 6-pack with and watch the footy. It was refreshingly drinkable and I was so glad to have found another of the countries that had eluded me so far. Not many to go now! If you can help me with any of the remaining countries (find list here) I would love to here from you either below or on my email gus.norris7@gmail.com. I'm happy to offer cash/beer trades for any help!